Sweet Thursday – and not just because of the Hallowe’en candy! – Ce Soir Arts – Be inspired tonight! Sweet Thursday – and not just because of the Hallowe’en candy! It’s Hallowe’en! If you’ve been to Ce Soir Arts lately, you know we’re in full swing with the theme. If not, come visit – and do set “use region settings” for environment. It’s purple passion like you’ve never seen it! It’s beautiful – and spooky, all at the same time! Visit the Gallery for a last look at some of my Words & Pictures. I’ve done something a bit spooktastic for the holiday, and I hope you’ll enjoy it – before we take it down tonight in preparation for our next Guest Artist – the wonderful Mathilde Vhargon. (Much more on that and her exciting new work in our next post – so stay tuned!) But do pop round to see what I’ve been up to lately…muahaha! Russell will be here for 90 minutes of his charming, beautiful, and intricate fingerstyle guitar and that velvety voice that delights with every song. He will likely offer us a fine mix of covers from the likes of Bob Dylan and Christy Moore as well as his own outstanding original compositions to enjoy. We’ll dance and chat up a storm with members of The Eponymous Family – and new folks are always welcome to drop in to hear Russell for the first time. 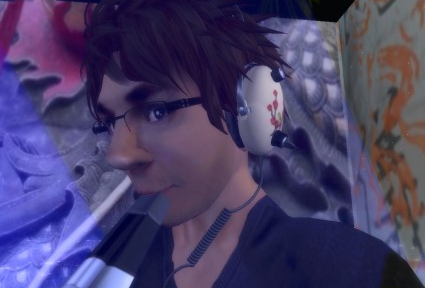 We are happy to welcome new friends – be they new to SL or just new to Ce Soir; they invariably become Russell fans. Why not? He’s truly a fantastic musician whose delivery is flawless. Besides, he’s loads of fun and it’s always a grand time that everyone enjoys! Don’t miss this show! Who knows what Russell might have in store (other than fabulous music and warm friendship)! He’s been adding to his repertoire some exceptional songs, so do come along to share the magic that is Russell Eponym. 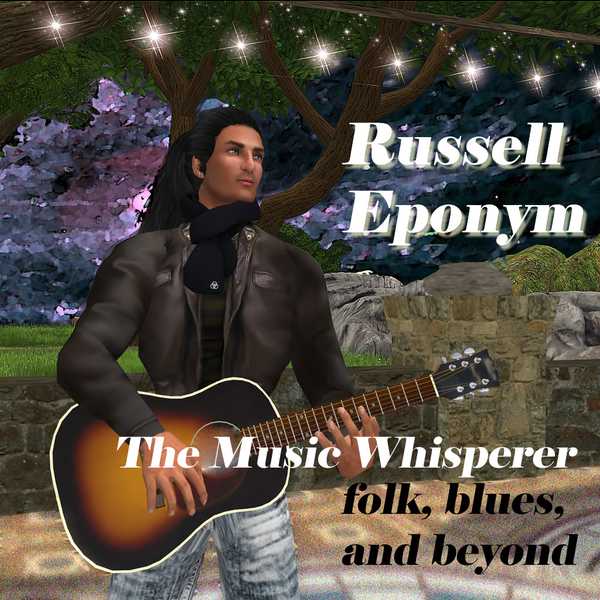 He’s called The Music Whisperer for a very good reason, for no matter what else the day brings, when it brings (especially) a whole 90 minutes of Russell‘s enchanting music…calm and joy ensue! After a break – during which I am sure we will all find fun Hallowe’en activities to engage our imaginations – we’ll come back to enjoy the enchanting CHILL from The Sound Jeweler, MoShang Zhao. Streaming live from his sound studio in Taiwan, MoShang brings us the very best in downbeat electronica. We look forward to enjoying this chilled-out groove every week, and are often joined by a very cool, eclectic crowd. Always a beautiful experience, filled with restful, energising music and fun times, we look forward to Thursday nights all week. MoShang is genius, and he never disappoints, delivering the CHILL in style every time. He feels the crowd so well and peppers his shows with just the right amount of informative, charming banter. It’s an experience not to be missed, so if you’ve not enjoyed this ultra-cool sound, come round at 8 PM. I call his gig the elegant slide into the night…and it’s always simply wonderful. His newest music (Suncake Lounge Vol. 2 – Multiply Me) is available for download at various sites, but do visit his own site for a sneak peek as well as other downloads you’ll enjoy. Come along for the Hallowe’en hijinx (well, Aeon will be here – haha!) – and do enjoy this fun holiday! BOO! Next Hallowe’en Recap – and the spookiness lasts longer than the candy – hehe!